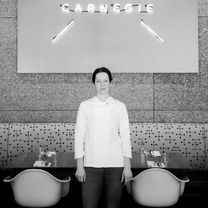 Sonja Finn is the Chef and Owner of Dinette restaurant and Consulting Chef of The Café Carnegie at Carnegie Museums of Art and Natural History. Sonja is a graduate of Columbia University (B.A. 2001) and The Culinary Institute of America (A.O.S. 2003) Upon opening Dinette in 2008, Sonja became Pittsburgh’s first female restaurant Chef/Owner. Sonja was also the first chef in Pittsburgh to receive a James Beard Award nomination—in both 2009 and 2010, she was a semifinalist for James Beard “Rising Star Chef of the Year”—helping to put Pittsburgh’s restaurant scene on the national stage. Additionally, Sonja’s been named number 10 of Mother Nature Network’s “40 Chef’s Under 40,” one of the Pittsburgh Post-Gazette’s “Young Pittsburghers to Watch” (2009), was twice a regional nominee for Food and Wine’s “Peoples’ Best New Chef” (2011, 2012), was featured on the November 2016 cover of Pittsburgh Magazine as the trailblazer of women chefs in Pittsburgh, named an ACDA “Woman of Achievement” (2017), and most recently named one of Pittsburgh Magazine’s “40 Under 40.” Sonja has also proven herself a trailblazer in sustainability. Dinette was the first Pittsburgh restaurant to be built with sustainability in the forefront—from choices during the physical construction, to the daily sourcing of all food and drink, to most importantly employing systems - good pay, health insurance, a reasonable work week – that ensure high employee welfare. Dinette was the first restaurant to be recognized as a “Sustainable Restaurant” by Sustainable Pittsburgh (2015) and just this April (2017) Dinette achieved the highest level of Platinum Plate, making it one of only four restaurants and the only independent restaurant in Pittsburgh to achieve top sustainability designation. ACDA 2017 “Woman of Achievement"
"Look! — We’re so Valentinesy. And you don’t need a reservation." "Olja Finn hosting guests is just part of the lore and hazing ritual of pantry station. Pictured here: the pre-appetizers for a modest table of four. "I can't even fit three frittos in the fryer," has been the plaintive bellow of numerous pantry cooks. cc: @goooooooom"
"If you want to know what the chef eats at the end of a long night: It's always Anchovy, No Anchovy. (and wine and a shot of espresso for good measure.)" "All the vegetables. (From the rooftop.)"